Supreme Court Victory For Insite! 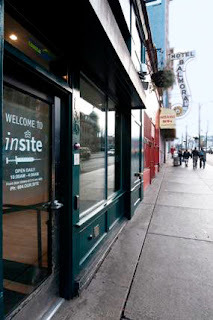 Insite is a clean injection site in Vancouver where addicts can go to inject in "a clean, safe, health-focused place where people inject drugs and connect to health care services – from primary care to treat disease and infection, to addiction counseling and treatment, to housing and community supports". 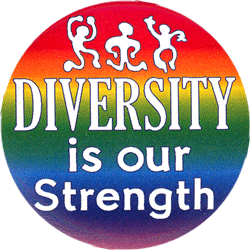 The Canadian Supreme Court has just re-affirmed it's right to exist in it's storefront locations in Vancouver. New needles and swabs are provided and nurses and social workers are on standby. Safe disposal of used needles is provided. Addicts are going to inject no matter what the laws say and it is best to provide a place for them to do so that protects the addict from HIV and Hepatitis and also protects our kids from stepping on used needles in their schoolyards. Addicts also know they are not going to be arrested. A win - win situation and it proves that sanity can prevail. Needless to say, conservative groups are outraged! Tough! I think the drugs should be provided as well. This would stop 90% of thefts and robberies in Vancouver. In time for your early Christmas shopping! RPG Jesus! 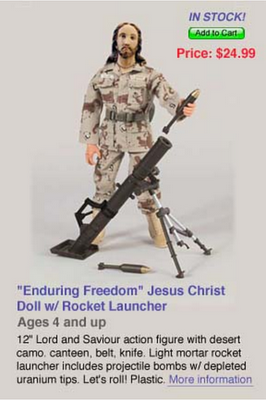 Gotta get our little christian soldiers ready for a lifetime of hatred, intolerance and killing! I got a phone call today from the person who bought our old 1994 Tioga MH. He actually bought it from our son who had bought it from us, but anyway... He had a list of questions for me mostly about electrical changes I had made to the rig and after we talked for a good half hour he told me how happy they were with the rig and how much fun they were having with it. They had just returned from a one week baseball camp for his son up in the Okanagan. It had a couple of small existing problems like a slightly leaking exhaust manifold and a windshield that would not seal properly due to some rust on the frame. We had fully disclosed these things during the sale and he had no problem because he could fix both things himself. He asked my advice on a couple of maintenance issues and thanked me for taking such good care of the rig. It made me very happy to get that call as I always hate selling anything for fear that there are hidden problems that I do not know about and pass on to the new owner. I am glad they like it and it has a lot of life left in it. As a matter of fact, I often wish I had spent some money on it and kept it instead of moving up. It has more power (Chevy 454) and a much heavier frame than the new one (2005 Ford V10) as well as getting better gas mileage. This morning was garbage day so I dutifully wheeled the garbage can and recycle bin down to the highway last night. Sometime overnight or early this morning the wind came up! It was from the southeast where our worst weather comes from. When I got up I looked down the driveway to see the garbage can on it's side with the lid gone but thankfully with 90% of the garbage still in it. The recycle bin was not so fortunate! It was upside down and empty! I walked down and retrieved a couple of our magazines from the neighbors yard but there was no sign of all the plastic bottles and cardboard! I am one of the people I detest, a litterer! After pickup I grabbed the bins to carry them back to the house and almost got blown down the highway myself. Norma says the news was reporting 80 mph winds which is almost hurricane strength. Just a breeze for those of you on the Gulf Coast but for here it was noticeable! 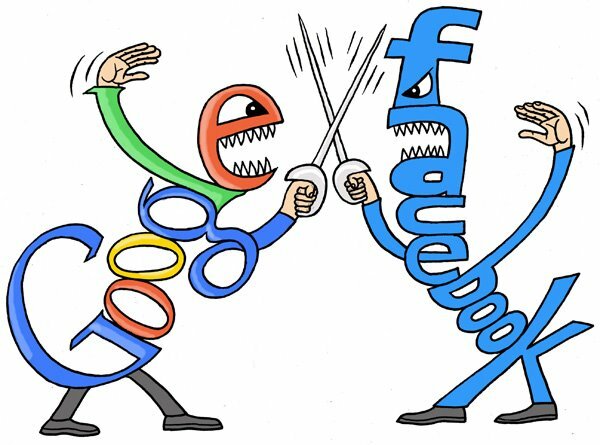 One thing I like about FB is that they seem to have limitless space available for photos whereas Google has lots of space but all your Google applications (Gmail, Blogger, Picasa) share it and I fear I am getting close to filling up my allotted space just with my Blog photos. If this happens, I will have to either eliminate old photos or buy more space, neither of which I look forward to. I was mixing up a cheese omelet this morning when I noticed a large splash in the ocean out the kitchen window. I was almost sure I saw a large fin in the water so I called Norma and we went out on the porch to watch. A minute or so later a huge Orca Whale surfaced, blew and rolled! It was a couple of hundred feet offshore right at the end of our driveway! She hung around the area and surfaced a couple more times, obviously filling her stomach on herring or pink salmon. It was a great show but by the time I thought I should grab my camera, she had left for more fertile feeding grounds. It is not a scene that translates well into photos in any case as they are quite a distance away and do not normally break the surface by all that much. The best photos are taken when you are above them and looking down at an angle. They never give me enough time to get the tripod and telephoto lens out. It was still quite a thrill to get a look at this visitor! This partly made up for the beating I took in the markets last week! And of course the final visit to Norma's implant specialist in Victoria. The bill was a little less than it could have been because some of the items on the original bill were not done at our request. It was bad enough in any case. We still have enough money left over for a winter in Mexico! Norma had another brush with the electric fence! She came in the other day and said, "I got it in the neck this time and I think my heart has stopped"! I told her I was highly trained in Industrial First Aid and I could assure her that if she could walk all the way into the house to tell me her heart had stopped then she could be assured it had not actually stopped. I don't think she bought my argument. The summer is coming to an end so it was time to cross one more job off the list. The main bathroom had an old Corian counter top with the sink molded right into it. I have no idea how old it is but it is at least twenty-five years. It was in good shape except for the sink itself which had some tiny cracks and unsightly staining in the bottom of the bowl. We went out and bought one of those newfangled counter top sinks and a new faucet set to go with it. I got my reciprocating saw out, put a new blade on it and started cutting out the old sink. It was tough going because the Corian was almost an inch thick in places but after a ton of (probably carcinogenic) dust which I tried to keep out of my lungs with a mask, I managed to cut around the outside and removed the old sink part of the counter top. The new one fit nicely over the hole and after a few hours of fitting the new tap and drain stem and modifying the house drain to fit, it was done! The drain leaked a little upon testing but after tightening everything up, the leak stopped. Norma does not really like the way the new white sink goes with the old counter top but I think it is perfect! The front panel under the sink is still off because I am building a drawer to take advantage of the space we gained by using the counter top style sink. It will get finished tomorrow. Life is Good! In the very early hours of September 16, 1810, Father Miguel Hidalgo y Costilla rang his Church bell in the central Mexico village of Delores (now Delores Hidalgo) and issued his El Grito de la Independencia (Call For Independence), calling his flock to revolution. The excesses of the Spanish occupation had become intolerable for the enslaved peasants of Mexico and Hidalgo took the lead in organizing the Mexican people along with the Criollos or Mexican born Spaniards to attack the hated Spanish Colonial Government and to drive the invaders from Mexico. ¡Viva los heroes que nos dieron patria! ¡Viva! ¡Viva Josefa Ortiz de Dominguez! 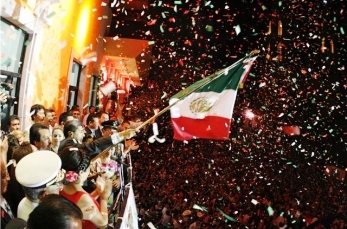 ¡Viva! ¡Viva Aldama y Matamoros! ¡Viva! My friend Les has just published an excellent post covering the times before the Revolution, explaining what lead up to the War For Independence. It will give you a greater understanding of what was going on in Mexico. We are back from a couple of days in Victoria where Norma had another appointment with her dental implant specialist. The appointment took a little over two hours and he wanted another $2,700 installment. And here I thought he only charged $1,000 per hour! She has one more appointment next week when he told us to have another $4,000 ready. This will bring the bill for this repair to close to $9,000! We are disputing one item on the bill that we do not think is necessary so that might bring this down by a thousand or so. I think we will be dipping into our "Rainy Day Fund" to pay for this job. Adjusting our lifestyle is not an option! Tea Party - "Let The Uninsured Die!" Is it possible the Tea Party went too far tonight? CNN's Wolf Blitzer posed a hypothetical question at the Republican debate tonight and the Tea Party showed their true colors. 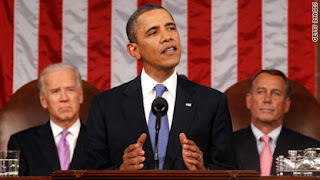 Listen to the applause when he asks if the uninsured should just be allowed to die! It is unbelievable that any intelligent person could consider voting for them! EDIT: Here is an email I just received from Michael Moore on the subject of 9-11"
There is not much more that needs to be said today. We all know how we felt on that day, and we all know what we've lost in this past decade. I said what I had to say about 9/11 seven years ago -- and thanks to some kind stranger who has posted it for free on YouTube, I'd like to share it with you again today. Let's make the next decade one of peace. P.S. I'd also like to share this essay from former NY Times Pulitzer Prize-winning reporter Chris Hedges. It is blunt and honest and worthy of reflection. I just noticed that I have had another Kiva loan repaid so it is time to loan the $25 out again! "Andrés de Jesus is 57 years old and resides in the city of Estelí, Nicaragua. He is married with five children and he is a merchant who sells lubricants. He has been in this business for seven years and started it through a loan, as he did not have his own capital. Prior to selling lubricant, he worked simultaneously in transportation and as a merchant selling basic grains. However, he decided to leave that business since it wasn’t very profitable and his earnings were very low. 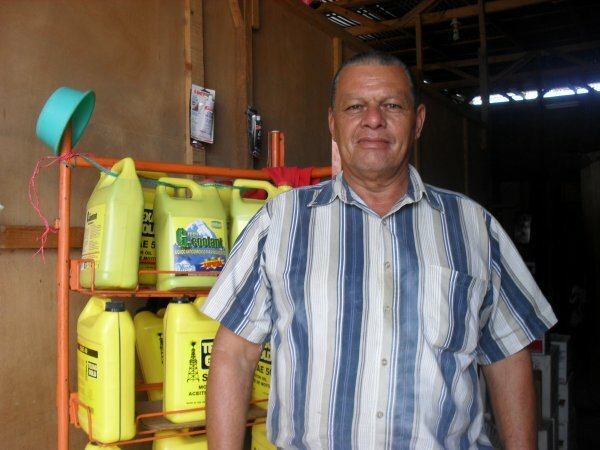 As a result, he decided to sell lubricants and has had better earnings than with his previous businesses. He is requesting the loan to purchase lubricants. 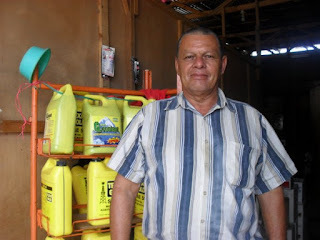 With this investment, he plans to keep his inventory stocked with all types of lubricants his customers demand. He considers the location of his place of business to be good for sales. However, he needs more products to sell so that he does not lose customers. He wants to improve his place of business, expand it, and improve his sales. His next goal is to provide his children with a professional education so that they will be someone in life and will be independent." If you want to try out Kiva for yourself just click on my Kiva link on the right hand side of the page. You loan out $25 to someone trying to start or improve a business and you are repaid over time. You earn no interest but get the satisfaction of helping out. There was a retirement party last night for one of the Telus guys. It was fun and everyone ended up back on our patio afterwards. 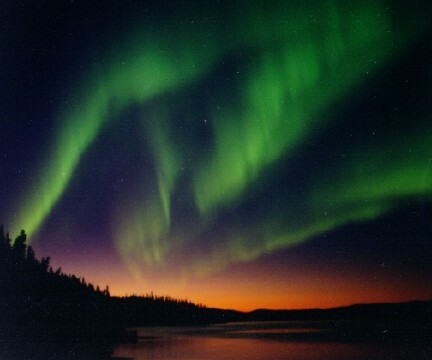 Just before midnight we were treated to a beautiful aurora borealis show that covered the entire northern horizon! I have not seen a show like this since we lived up near the Alaska border. It was an amazing show and I just found out it is the result of a major geomagnetic storm on the sun and the resulting CME's hitting the earth. We can expect more in the next couple of days. This photo is not mine, it is a stock photo off the Internet. We just had an earthquake! I was in the office and felt the room swaying back and forth. I stood up and had to grab the desk to steady myself. Norma was in the bedroom and the mirror and TV started swaying. We went outside but by then it was over. It lasted maybe 30/40 seconds. It was centered at Nootka Island on the west coast of Vancouver Island about 160 KM from Campbell River. Cool! My first earthquake! I was just on CKNW 980. They asked for comments from people who had felt the earthquake so I called in. I think we saw Obama take the gloves off tonight! I have been waiting for him to start using the Bully Pulpit to put his ideas directly to the American people and tonight that is what he did! He said he was going to take his message to all corners of the country and speak to the people. Tonight I saw a flash of what I saw when Obama was running for President. A clear vision and the ability to express it. He drew a few lines in the sand. He would not abide with taking away the rights of the middle class, of the benefits they had fought and paid for. He said he will fight against the removal of collective bargaining rights. This is what Americans need to hear. He has his vision back! The campaign is on! To Hell with the "American Family Association" and their boycott. This will make me watch Dancing with the Stars from beginning to end for the first time! Sandy and Darrel, a couple from BC wrote to ask my advice for their first RV trip to Mexico. I sent them answers to their specific questions and also offered some unsolicited advice. After thinking about it, I decided to reprint my letter in the Blog. It might be of interest to others contemplating their first trip South Of The Border. I am sure many others will argue with some of my statements but this has been our experience with this beautiful country. First of all, thanks for following our adventures. You will love Mexico and you have the perfect rig for Mexican roads and RV parks. Our medical insurance comes from our Desjardins Visa card company in Quebec. It is the only one we have used and are very happy with it. Norma broke her hip in Tucson several years ago and they flew us both home in a Lear Jet for repairs and then back to Tucson to pick up the motorhome. Vehicle insurance comes from Mexico Bob's San Xavier Mexico Insurance in Arizona. We have found them very reasonable and if you have been following the Blog, you know we have had three claims. They have paid everything. Also remember you can get a refund from ICBC for all the time you are in Mexico. Just keep all the receipts you can to prove you were out of their jurisdiction. As far as border crossings, we always enter Mexico at Lukeville, AZ / Sonoita, MX. This is because we visit friends in Yuma on the way down and also get glasses in Algodones, just across the border from Yuma. Lukeville is an easy crossing and is a short days drive to Edgar and Anna's Punta Vista RV Park in Santa Ana. Coming back, we have used Lukeville, Laredo, TX (Columbia Crossing) and El Paso, TX (wouldn't cross here again - Juarez is scary). The same rules apply going in either direction. Cross as early in the morning as you can and do not spend the night on the MX side near the border. The best method heading north is to spend the night about 100 KM from the border in MX, wake up early and get to the crossing before 10:00 AM or so. We have never had a problem, this is just the recommended method and that is what we do. Also, have several sources of cash available. We have three debit cards as well as four credit cards. We have had several cards compromised over the years while in Mexico as well as one ATM card swallowed by an ATM. None of this has cost us anything but just in case it happens again we carry lots of cards. Mexico is a cash economy so do not think you can depend on credit cards for day to day expenses. Buy pesos as soon as you cross and please do not try to use USA dollars. The drug violence is just that - drug violence - and does not affect RVers. Having said that, we always use common sense, stay out of drug areas and late night bars, don't drive around at night, don't flash money around.... Pretty much the same as we do at home. "Situational Awareness" as my retired US Military friend Belgique calls it. There have been more RVers murdered in Canada (2) in the last few years than in Mexico (0). Do not believe everything you see on FOX News. If there is anything else we can help with or explain further, just email! You also might want to join this Mexico RVing Forum. In the USA we use T-Mobile pay as you go cell phone and in Mexico we have a Telcel pay as you go phone, both very cheap to buy and load with time but expensive if you have to use them to call Canada. Skype is our main method for calling home. Walmart in the USA sells another very cheap pay as you go cell plan. Unless you have an unlocked SIM type phone, you will have to buy phones for each country but they are cheap. We also bought a Telcel Internet Broadband stick for Mexico. It offers 3 GB of data for about $300 pesos a month. Coverage is excellent! We also have a Virgin Broadband stick for the USA. They are all pay as you go. WIFI coverage is fairly good in Mexico with most RV parks having WIFI of varying quality. Usually you have to take your computer to the office or some other designated area. There are Italian Coffee Company stores everywhere that have WIFI as well as many hotels and restaurants. We just got tired of carrying the laptop around and bought the Telcel Broadband plan. It worked everywhere. Be sure to buy a copy of the Travelers Guide to Mexican Camping by Mike and Terri Church. You can order it from their website or get it from Amazon.ca. This book is indispensable for Mexican RVers. It gives directions to and descriptions of every RV park in Mexico. You will not be able to find most RV parks without it. Do not go without it, you cannot buy it in Mexico (unless you run into Mike and Terri as we have three times)! Take lots of reading material, English books are very expensive and hard to find in MX. Take extra RV supplies (white hose, in line water filter, toilet chemicals, sewer hose) as they are not sold in MX. Be sure to have at least two 20 / 30 amp converters as 95% of RV park outlets will be the three prong household type. Be sure you can plug in. I also carry enough oil and a filter to be able to change the oil once in MX. There are many roadside mechanicos who will do it for a few pesos if you have the parts. Multi grade oil is hard to find in MX and synthetic oil is impossible to get. Take a gallon of distilled water from the USA for your batteries. It is not available in MX. Plan on using your generator much more than in Canada or the US as power is not as dependable in MX. For example, in Merida every three spots share one 20 amp breaker! If a park is crowded there is a good chance voltage will be as low as 99 volts. Get a cheap meter from Canadian Tire and learn how to use it. Mexican butter does not taste anything like ours. I can get used to it but Norma hates it and stocks up the freezer with butter in the USA. Beer and Chilean wine is reasonable in MX but if you drink scotch, take it with you. Every city of any size has a Walmart Superstore and Mega is the other large grocery outlet. There are quite a few Sam's Clubs. Experiment with food. Do not be afraid to eat at street taco stands. If you have not traveled much you might get a intestinal infection. It is not a big deal and will not last long. We take Imodium with us but pharmacias are very good and carry almost everything we get at home although with a Spanish name. It is recommended to get a Hepatitis A (corrected - thanks Kathe) shot before you go and we did. Mexico is not "dirty", in fact restaurants are usually spotless. Eat in the centros and squares. I love Mexican restaurants! They never rush you and you only get a bill when you ask for it, "La cuenta, por favor". You can sit at a table on the square ("jardine") for hours and watch the young people. It is a great way to spend an evening. In MX we dine out an average of once a day, maybe more. You can dine out cheaper than buying and preparing food in the RV. We use taxis most of the time as streets are narrow and confusing and parking is difficult in the cities. It also lets you have that second (third?) glass of wine. Cabs are very cheap but establish the charge before you get in the cab as the (very) odd one will try to overcharge. Like you say, our paths will likely cross. Mexico is a small country! Added:Another thought I should share. To be clear, we have never had a problem with crime in Mexico. One attempted (failed) camera snatching in Guadalajara and one smooth talking con artist who "needed" to "borrow" $400 pesos to pay school fees in San Miguel de Allende (successful). But that could happen anywhere. However, our friend Les was robbed at gunpoint in his motorhome in a gas station. Les is a retired British Bobby and had the good sense to have a "dummy" wallet. It is an old wallet with two or three hundred pesos plus an expired credit card and a few old business cards in it to make it look real. He carries it on the front consul. When the bad guy stuck his gun in the window and demanded money. Les grabbed the fake wallet, threw it out the window and when the robber bent over to pick it up, drove off. This is what I am going to do from now on, carry a fake wallet. This is good advice in any country! I decided to replace the fuses in the line to the new 760 watt inverter with an 80 amp circuit breaker. I ordered the circuit breaker from eBay for $13 including shipping and it arrived on Thursday. I cut the fuse holders off the cables and connected the circuit breaker. I turned it on and plugged in the fridge. It fired right up drawing about 480 amps for a few seconds and then settling back to 220. I added the TV, StarChoice receiver and laptop to the inverter and it handled everything just fine, allowing the fridge to start and stop without even approaching the capacity of the inverter. I unplugged the motorhome from the workshop and let everything run off the batteries just to see what would happen. The fridge cycled on and off a few times and the TV played away. After a couple of hours my voltage had dropped a volt or so proving what I already knew. The fridge will be fine running while we are driving and the batteries are being charged by the vehicle but my battery capacity is insufficient to run the fridge overnight while we are boondocking in a Walmart or such. It will be fine while we are stopped for a meal but that is all. This is no problem. I will turn the fridge off overnight and the insulation will keep it cold until we start up the next morning. It will not be used for perishables, only water, juice, beer, etc. When we are in an RV park it will just plug into a regular plug. It will make life much easier traveling in Mexico. 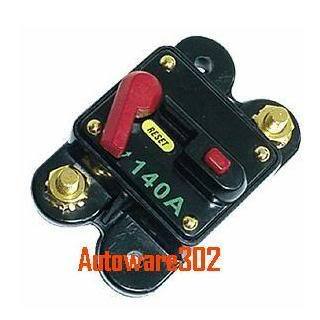 Photo shows a 140 amp breaker, mine is the same only 80 amps.